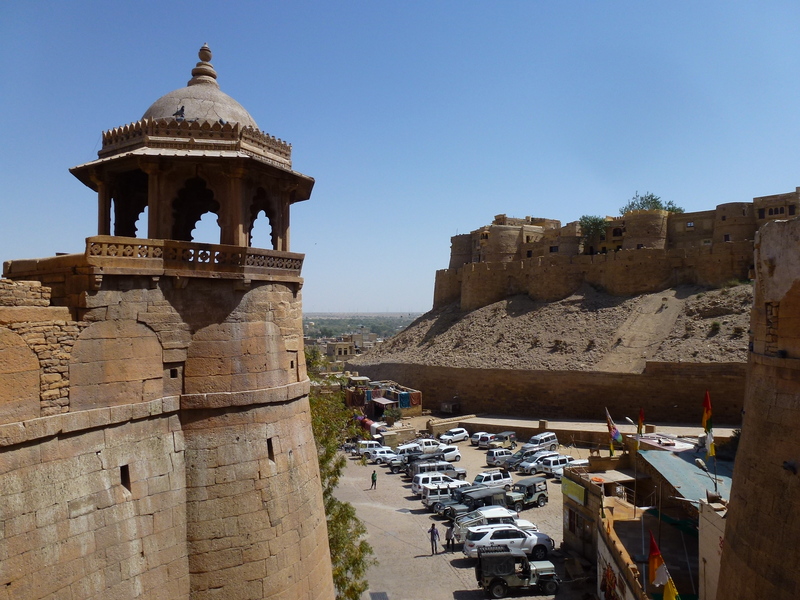 A view of the walls and towers of Jaisalmer Fort. From Jodhpur we drove to Jaisalmer, a city in the Thar Desert near the Pakistani border, about 177 miles (285 km) from Jodhpur. 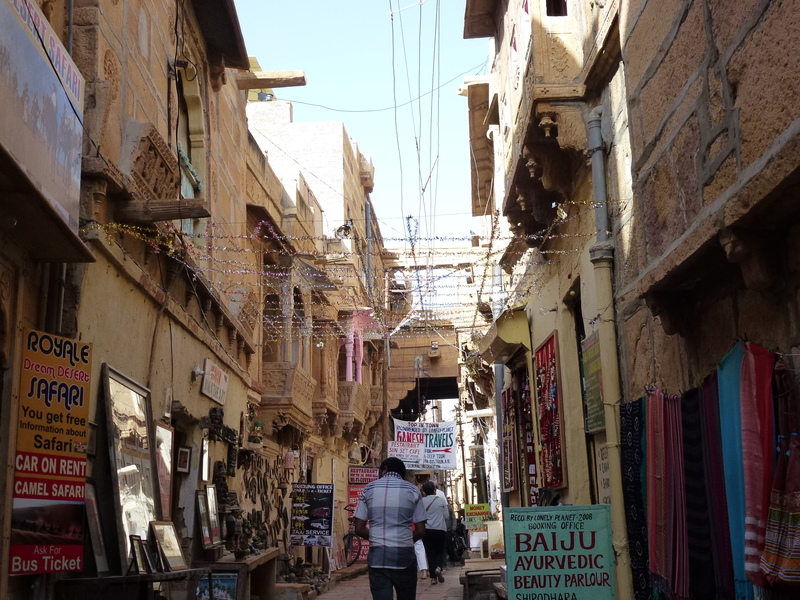 The old part of Jaisalmer is contained within the extensive walls of the fort that sits on a hill, rising above the desert. It has a different feel than other parts of India, due to the desert location. The ancient fort city was founded back in 1156 and is still inhabited by 3,000 people. Jaisalmer had a strategic position in the 16th century, it was on the camel train routes between India and Central Asia. The fort city has narrow alleyways, with apartments, temples and shops practically stacked on top of each other. There are a number of Jain Temples within the fort. They take advantage of every inch of space within such a confined area. (Practical tip: Since you cannot wear shoes in the temples, bring your own “slipper socks” – otherwise your bare feet will get quite dirty). Chandraprabhu Temple. 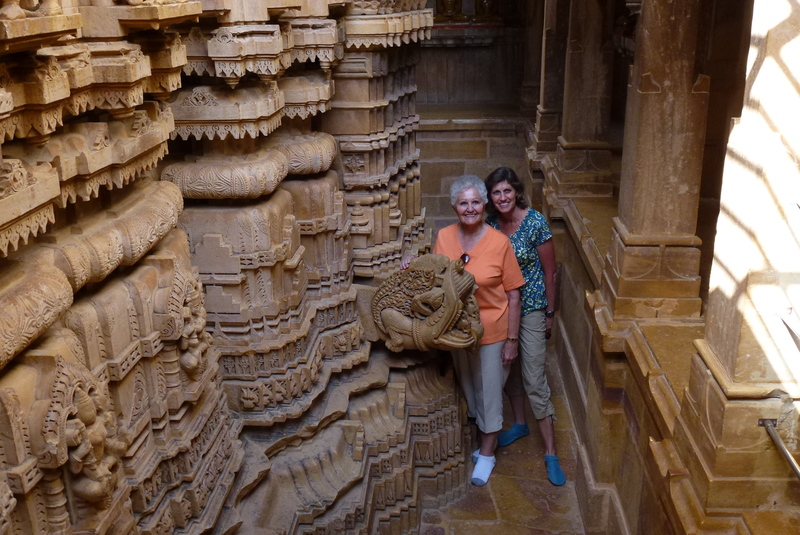 This temple was built in 1509 and has many intricately sculpted pillars. It is small, with a couple circular levels and rotunda ceiling. 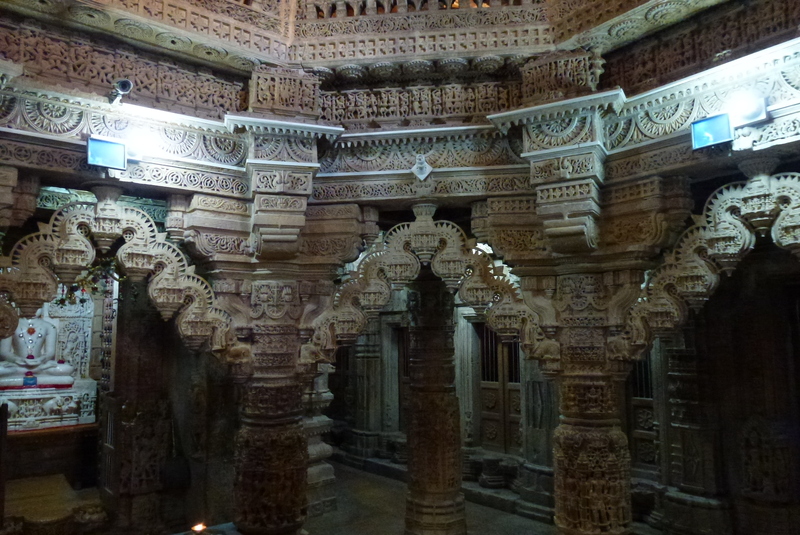 Interior view of Chandraprabhu Jain Temple. Rikhabdev Temple. Like many structures within the fort, space is tight around this temple. Take the time to soak in the beautiful intricate carvings and shrines. This temple and the one below also date from the 16th century. The narrow confines of the Rikhabdev Jain Temple. Parasnath Temple. Another Jain Temple in the fort city is Parasnath. There are various interesting shrines made of various materials (including metal) and an underground library with ancient manuscripts, all tucked away in the corners and below the structure – a bit like a maze. The magnificent entrance to the Parasnath Jain Temple. Wandering the Fort City. There are some great restaurants and shops hidden in the nooks and crannies of the alleyways of the old fort city. The vendors are friendly and we purchased some excellent paintings of desert scenes from one artist. One of the narrow streets in the fort city. The Fort Palace. Just inside the northeastern gates is the Fort Palace. 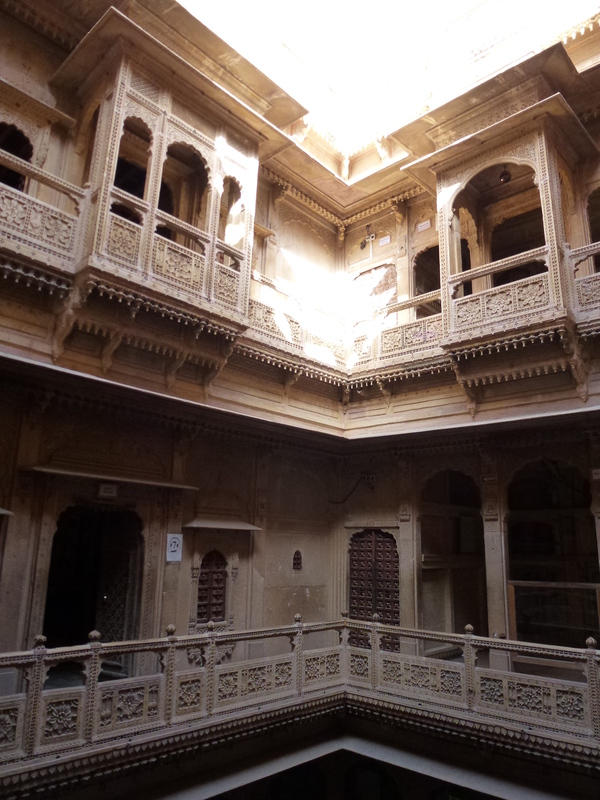 It was the home of the rulers of Jaisalmer and contains some beautifully restored 18th century rooms. 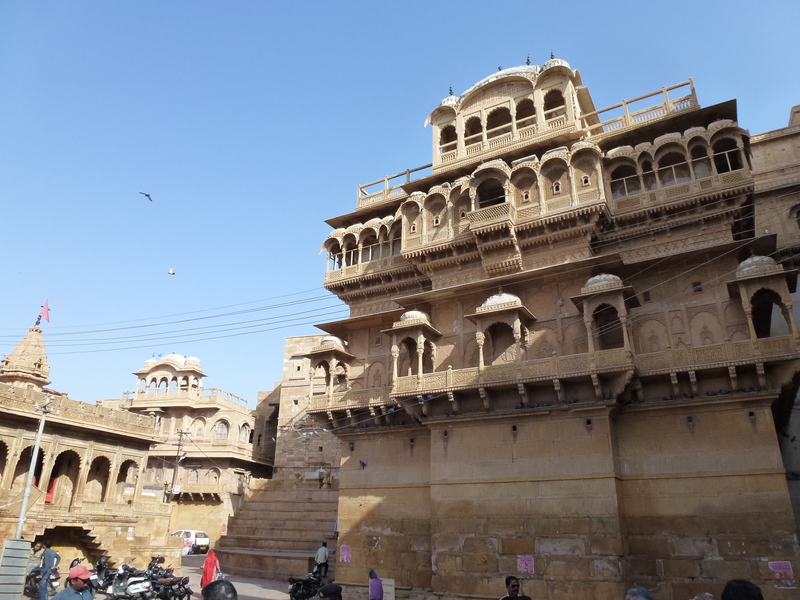 This is the Jaisalmer Fort Palace – it is worth touring, not only for the interior views but also the views of the old fort city from its upper levels. 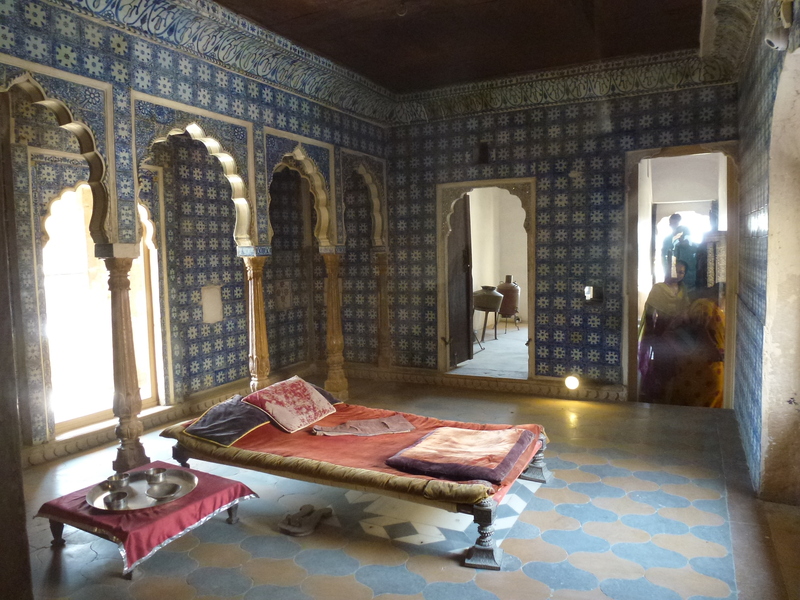 A bedroom in the Fort Palace. View of the fortified city from the Palace. Kothari Haveli. In the fort city and on the northern perimeter there are several well preserved 19th century Havelis (rich merchant homes). We visited one of them. The family who lived here gained their fortune in brocade and jewelry. An audio guide and signage in the rooms provide a good understanding of life in the 19th century for the upper class. The internal courtyard of Kothari’s Patwa-Haveli Museum. 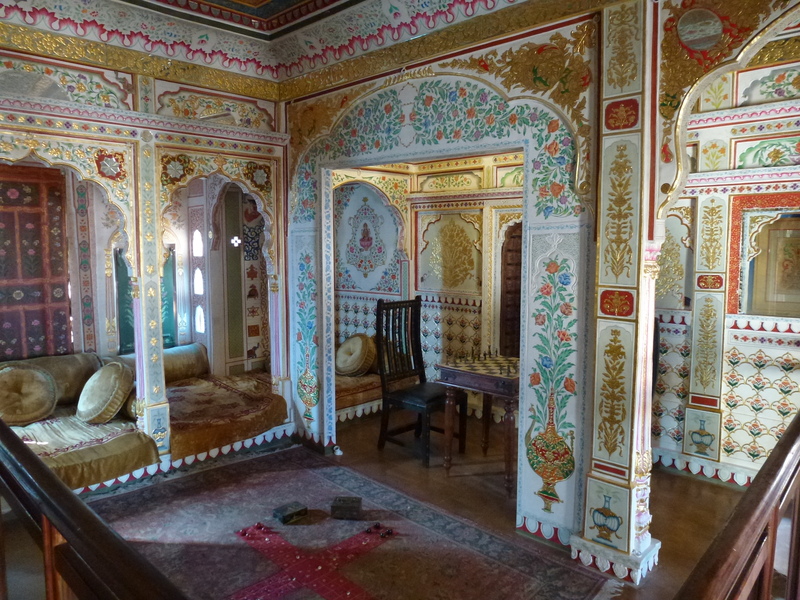 One of the richly decorated rooms in the Haveli. Bada (or Bara) Cenotaphs. 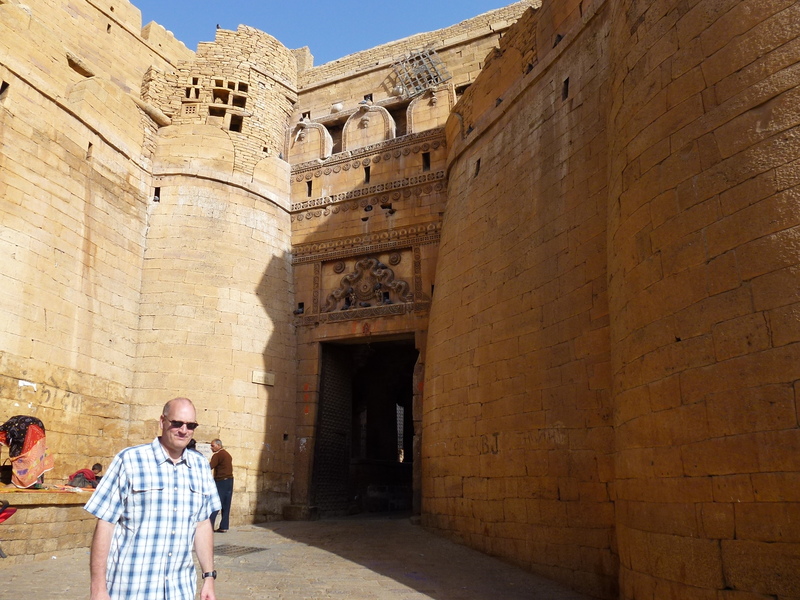 Just 6 km outside of Jaisalmer are a series of royal cenotaphs or memorials. 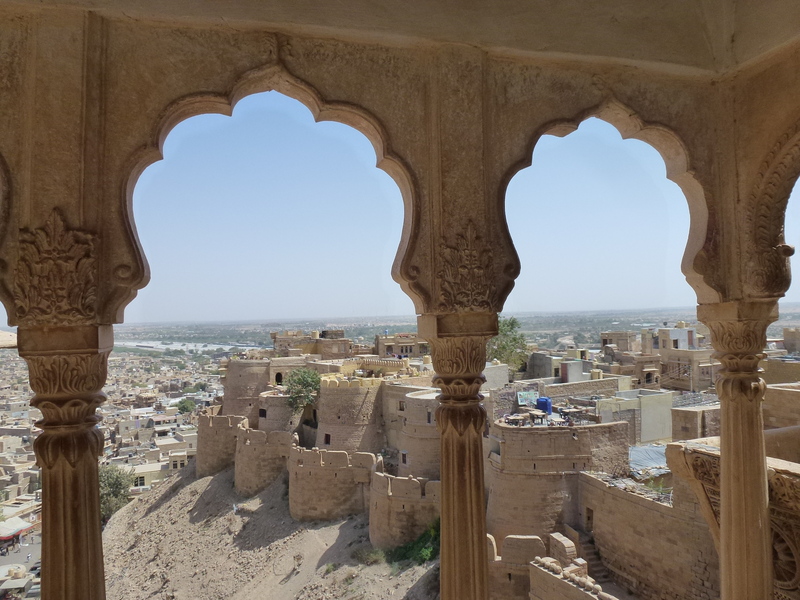 There is a great view to be had of Jaisalmer fort as you drive back towards the city from here. Very few tourists visit these cenotaphs, which are slowly crumbling into the surrounding sand. Just outside the city are the Bada Bagh Cenotaphs. 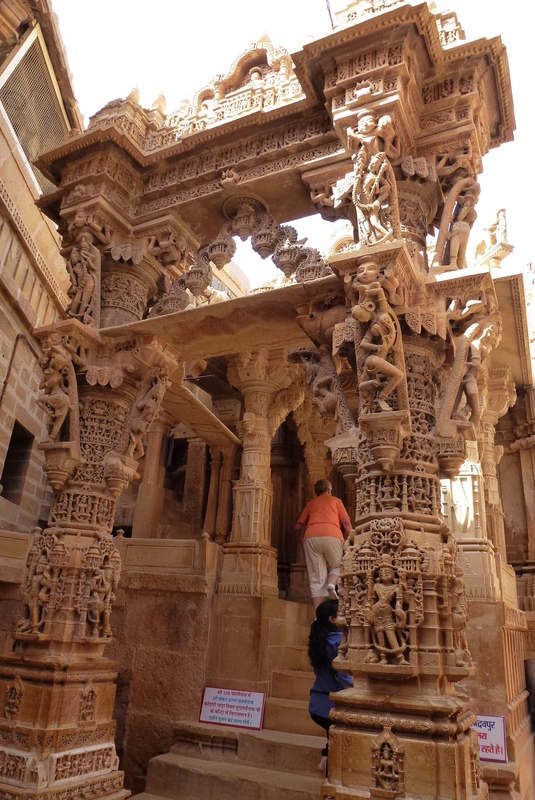 These are memorials to the royal families of Jaisalmer. Gadisagar Lake. 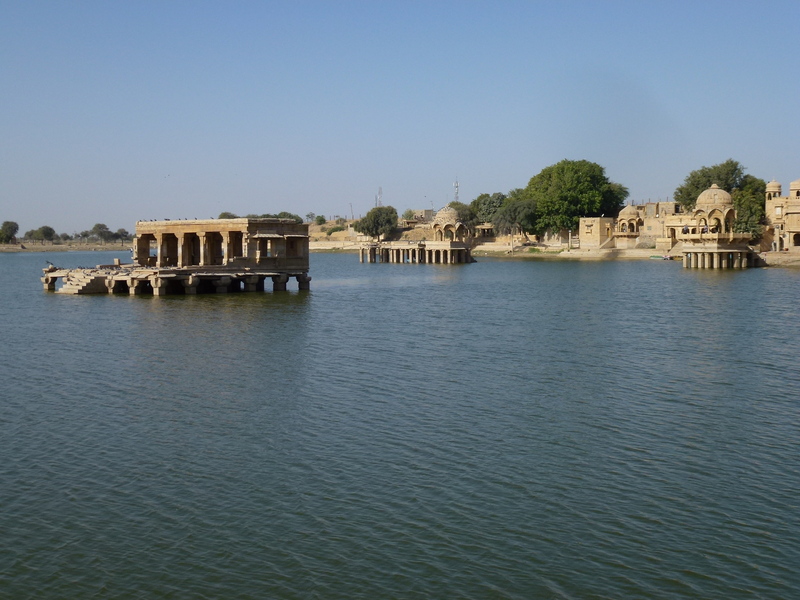 This lake, on the outskirts of Jaisalmer, was the city’s main water supply hundreds of years ago. It has some interesting ruins around the shores and in the lake. The lake stands out as a refreshing spot in this dry desert landscape. A view of Gadisagar Lake. Thar Desert. 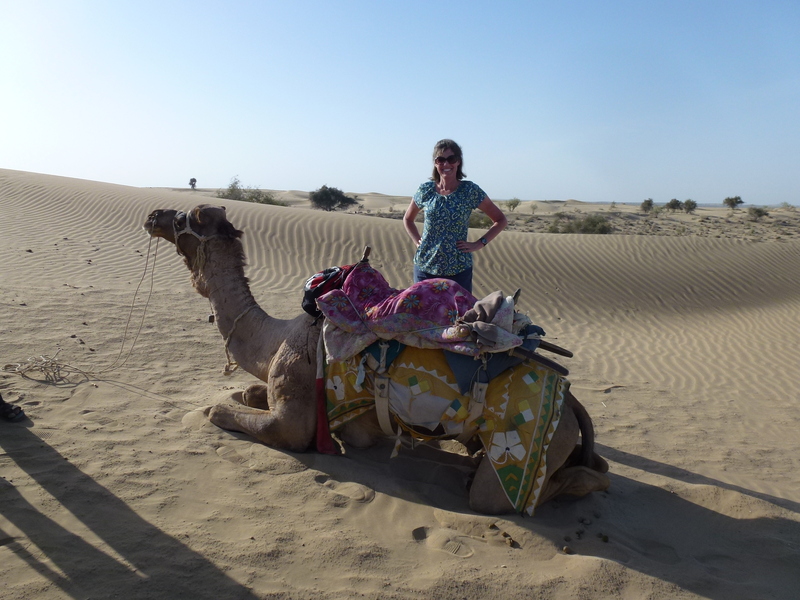 Just about 20 miles (30 km) south of Jaisalmer are some accessible dunes of the Thar Desert. We spent an evening out in the desert riding camels, enjoying the sunset view and a dinner with a dancing show. Women gathering water at a well in the desert – almost a biblical scene of life in the desert. Robyn giving her camel a rest. 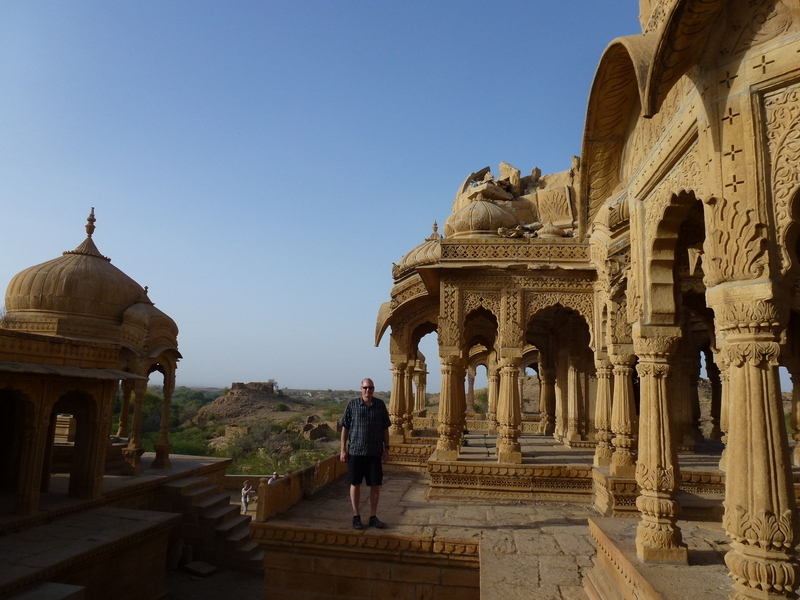 Posted in India and tagged Forts in India, Jaisalmer India, Thar Desert, Things to see in India on July 12, 2015 by Paul Terry.